Today I have a lovely interview with Janine of Guermantes Vintage and some stunning eye candy from her perfectly curated boutique. Hi Janine! Thank you for the interview. I had so much fun looking at your shop today. It's like walking through a fashion history museum! Fashion history museum is definitely one of my goals in stocking the shop! I really look at the whole thing as my collection, my archive, and I try to stock not only things I find beautiful / flattering, but things I find to be rare or interesting. When I photograph items for the shop I feel like I am cataloging them for posterity; it's a way to feel like I will always have these pieces even after they've been sold. Many of us love the idea of wearing vintage and antique clothes but are nervous about cleaning them. Since you work with so many very old pieces, do you have any tips on cleaning and storing antique clothing? I do have a few cleaning tips: Oxiclean is truly an amazing product. I am actually amazed at the things I've seen it do. Just be careful of colorfastness and delicate fabrics! I learned that the hard way. For things that can't be washed in Oxiclean I love to use regular old dish soap, which is gentler than even Woolite and does a great job of cleaning too. I feel like half the fun of wearing and selling vintage is the places you go and the interesting people that you meet. What are some of your favorite places to hunt? How would you recommend storing an antique clothing item to help protect it when not being worn? Well, I have to say, no wire hangers IS pretty important. I like to use old padded satin hangers - I get them from the local thrift store for really cheap and they are great. It's good to know what to hang and what not to hang, too. 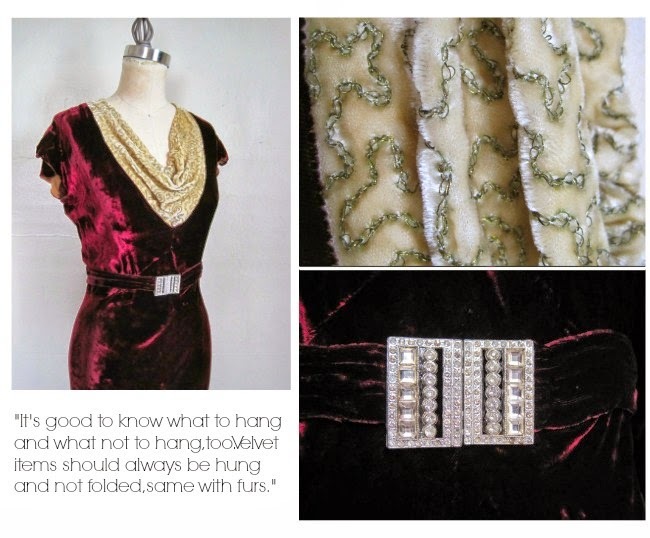 Velvet items should always be hung and not folded, same with furs. Delicate items like chiffons, and older antique pieces should be folded, not hung. It's devastating how many 20s dresses are shattered at the shoulders from improper storage! Devastating! What is the most bizarre item that you have found in your travels? Hmm this is a tough one..... There is one thing that I collect that people consider rather bizarre, and that is Victorian era hairwork. It's actually such a fascinating, forgotten art form - very intricate jewelry and fancywork wreaths all made out of human hair. What is the one thing on your wish list that you haven't found yet? Well I just recently acquired a MAJOR wish list item of mine that I'd been wanting for just about forever - a 1920s cocoon coat with stenciled gold art deco motif (you can see it on my instagram! It's amazing!!). Another one that I just listed in the shop that was a biggie for me was a 1920s dress with monkey fur trim. Speaking of monkey fur, actually I think my most major unattained wish list item would be any surrealist Schiaparelli 1930s pieces. I love her work during that era. Just incredible. Guermantes Vintage is an interesting name. Is there a story behind it? Like many Etsy vintage sellers, I started out selling stuff I found at thrift stores and from there my shop evolved into something very specific and curated. You really learn what your interests and passions are. 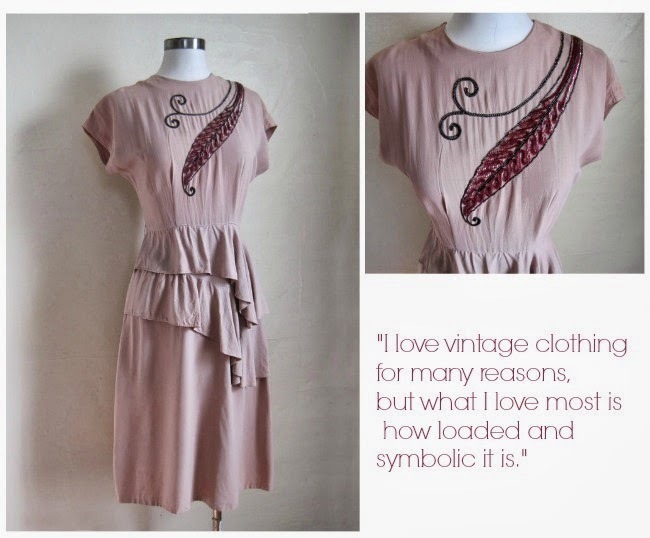 I love vintage clothing for many reasons, but what I love most is how loaded and symbolic it is. The name of the shop is taken from Proust, whose narrator experiences these very visceral memories. What memories point to is so unique to each of us. And so powerful. 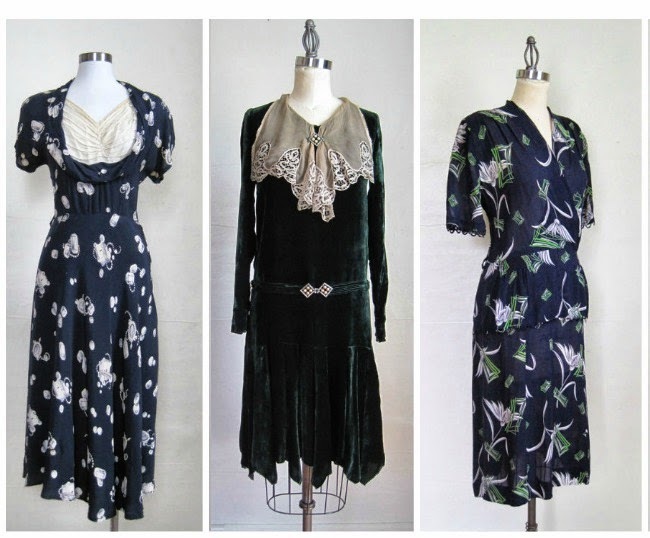 Vintage clothing really points to things - on a personal level each piece has its own history, its own past life, and it's fascinating to imagine who might have owned a particular piece, what their day to day life was like. On a broader scale, vintage pieces reveal so much about their era and that era's relationship to the arts, to politics (have you heard of the Hemline Index theory?? amazing), etc. 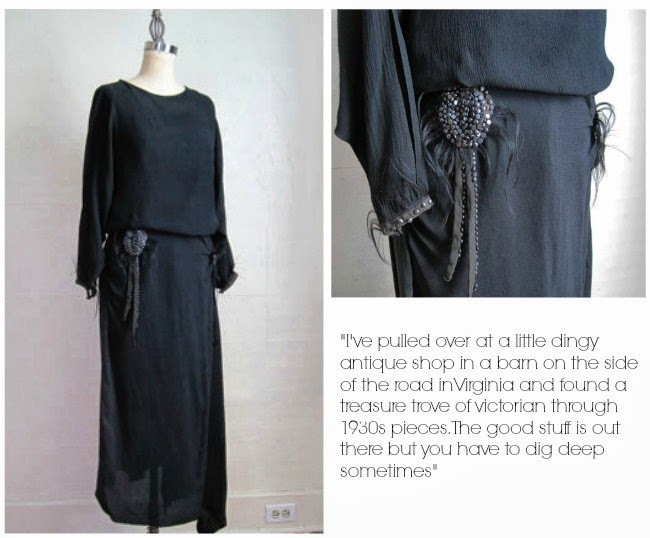 So really with every vintage piece its like Proust's narrator biting into a Madeleine. Tenfold. It just paints such a vivid, full picture in an instant, and on so many levels. So that's why I took the name from Proust. People always ask about the name so might be good to explain it..
More specifically, Proust's narrator was obsessed with a family called Guermantes. The mere name became a symbol for him . It meant elegance, wealth, and perfection incarnate. They were mythological to him. I get the same awestruck feeling with many of the pieces I've collected for Guermantes Vintage. They are just so fine and so exquisite. But with vintage all that fineness and magic can be owned, and it all gets transferred to the wearer. It's kind of amazing. Great interview - and what absolutely stunning curated pieces! Such an engaging, lovely interview. I've always adored the interview posts you've shared here over the years, and this gem in no exception (plus it was just the reminder I needed to buy some Oxiclean for a couple of the pieces I picked up on our recent travels to Calgary, which are in dire need of a its near magical cleaning powers). Wow, this is great! And she has chosen some incredible pieces for her shop! I'm melting inside!!! I'll definitely have to get some Oxiclean as well, and I'm so glad to have confirmation on how I'm storing some antique pieces. Phew! Great interview! Im heading over to her shop now to check it out.